Commander’s Palace is a New Orleans institution, they make fabulous gumbo. 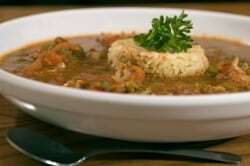 Gumbo is a medley of seafood, onions, garlic, peppers, roux, if you haven’t tried gumbo, you don’t know what you are missing. Make a roux with the flour and shortening. Add garlic and cook until golden brown. Add onion, bell pepper, and celery and cook until transparent. Add shrimp and tomato sauce, simmer 10 minutes, stir in water, and blend well. Add all other ingredients except okra and oysters. Cook 1 hour, add okra, and cook 20 minutes. Add oysters and cook 10 minutes longer. Serve in a soup bowl over steamed rice. Love cajun-style food? Try these cajun-inspired recipes. Thank you for your comments, they are much appreciated. Don’t be so unkind. Stephanie is offering her advice. Take it or leave it. I can’t imagine leaving shrimp in a gumbo pot for 1+ hours….it would turn out to the equivalent of shredded tire pieces!!!! I’ve cooked gumbo at least 75 times in my life and I’ve ALWAYS put them in maybe 15-20 minutes before serving, otherwise WAYYYYYY over cooked. Agree Samantha… I would never do this also, with adding water… it will not have good flavor. I make a stock with all seafood shells, heads, etc. with onion root, shell, celery root and leaves. That stock taste like seafood stew and you add this instead of 3 qts water. Then you can add seafood late and have a rich, deep flavored gumbeaux! Should the roux be cooked over high heat and how long? I also noticed they put the shrimp in early, wouldn’t it over cook? When I do a roux I use medium heat it takes about 45 minutes to get nice and dark and usually add shrimp the last 30 minutes. When I was in culinary school, we browned flour in the oven. We put some in a pan, baked the flour at 350 degrees until it was brown, then made the roux. You may want to try this to make a nice roux.